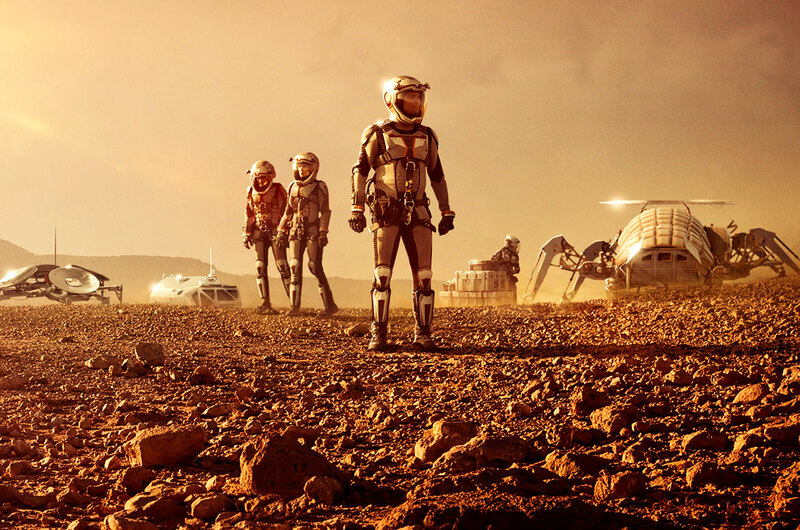 National Geographic’s ‘Mars’ is one of the shows that’s stayed with me over the last year or so Cutting between a fictional future expedition and interviews with scientists and thinkers about the costs of that mission it managed to balance the joy of ‘SPACE!” With some pretty solid factual stuff. ‘Grounded’, the second episode probably did it best. The episode catches us up to that first, haunting look we got at the Daedalus crew, exhausted, frightened, dragging a sled with their injured Commander on it through the Martian night. It’s an audacious play, resolving a flashback structure so fast and it’s not the only one the episode pulls off. ‘Grounded’ cuts between three time frames, not two. The first is our usual position in 2016, where we get talking heads walking us through the perils f long duration spaceflight and the human toll, in every level, that this work takes. Cleverly, the episode uses the year long voyage of Scott Kelly and crew aboard the ISS as the foundation for this section. Kelly’s historic voyage is the backbone of the episode and it’s unvarnished, human and deeply endearing stuff. Kelly’s a quiet, polite, hyper competent man with a wicked sense of humour and a daughter profoundly weirded out by her dad working in space for a year. She comes out of the episode best of all, a smart, funny kid who misses her dad but isn’t quite sure how to articulate it. That human cost of successful flight is, in turn, spun into a discussion of the human cost of failure. Footage of the Challenger disaster will never be easy to watch, nor the Apollo 1 crew and they are both present here. The message, like last week, is clear but unlike last week is entirely focused on the human component off the mission; we’re fragile. This is difficult. Not all of us are going to make it. That brings us back to Mars, and Ben Sawyer’s injuries and the price everyone pays for them. It also brings us too the third time period we see. Sawyer, his spleen ruptured, a rib broken and possibly concussed, drifts in and out of consciousness. When he passes out, he flashes back to a moment as a boy when his father took him out to make a model of the solar system. The construction of the model takes up most of that plot and it’s done almost entirely in silence. Out in the desert, it’s an almost dreamlike sequence that pays off in the closing minutes of the episode. At around the halfway mark, we see Sawyer and his father on a rocky bluff overlooking the plain they’ve been working on. The ‘solar system’ is laid out below them, at least a mile wide and Sawyer spots each planet through the telescope they’ve brought with them. It’s a gentle, almost silent moment, the point where the astronaut who would lead humanity to Mars is born. Bt the significance isn’t really apparent until the 2033 plot ends for the week. With an axle on the rover broken, the Daedalus crew are forced to hike the remaining sixteen kilometres to their new home, in suits with failing battery packs and as the temperature plummets. By this time they’ve discovered the true nature of Sawyer’s injuries too and have no choice but to push on. It’s a powerful, almost silent sequence of events that focuses entirely on the horrible conditions they’re under and not at all on what they’re feeling. As they find out when they get to the hab, Sawyer has effectively sacrificed his life twice over to save them; once to re-wire the ship during re-entry and once by not telling them how badly he’s hurt. They do their best to save him, check in with Earth and have no choice but to wait and do their best to keep their people and their mission alive. The episode closes with Sawyer waking up, putting a suit on and walking out of the Hab. It seems odd, especially as he covers an impossible distance and his suit was cut open during the operation. Then, he reaches a hillside and looks out across Mars. And then we’re back in the hab, with the team doctor calling Sawyer’s time of death. It’s a gentle, almost poetic sequence that both contrasts and brings into sharp relief Sawyer’s inherent fatalism. He was prepared to die on this mission and he does, but the manner in which the brutal pragmatism of survival is demonstrated is both compassionate and deeply personal. It pays a lot like the ‘return’ of George Clooney’s character in Gravity. It could be a hallucination, it may very well be but it could also be something similar to Frederick Forsyth’s The Shepherd. A spiritual interaction in a physical world. An astronaut looking out across the world he died to get to. A destination reached and, as Ann Bruyan points out in the episode, the latest version of human sacrifice practiced. Mars is available on DVD and blu-ray now.